The Mountain Counties Area spans over 15,700 square miles, encompassing most of the Sierra Nevada. 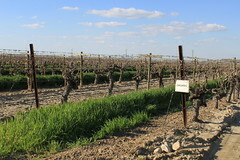 Much of the state’s precipitation falls here in the winter as snow, slowly and steadily melting in the spring to support the forest vegetation; then flowing downhill, filling the state’s rivers and providing water for cities and farms, eventually flowing into the Delta, where some of the water will be picked up by the export pumps and continue its journey south, providing more water for cities and farms and ultimately to Southern California. 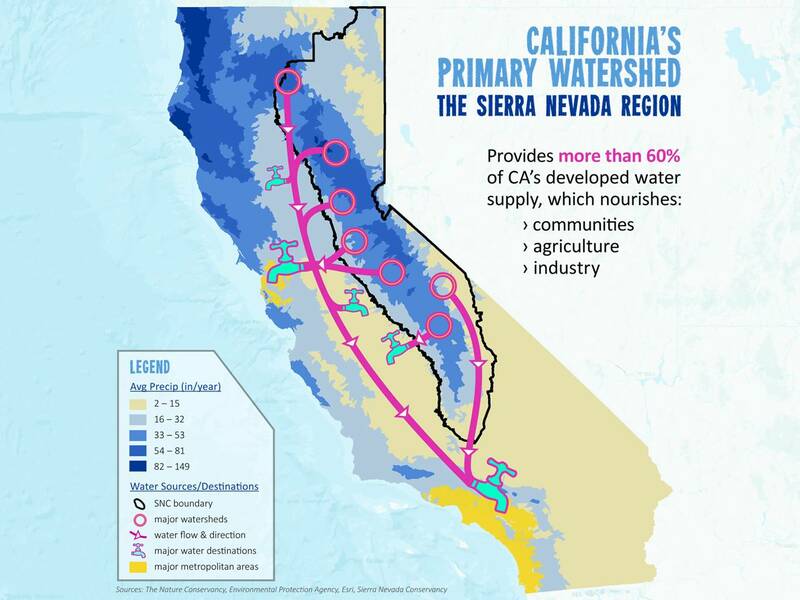 More than 60 percent of California’s developed water supply and more than 75 percent of the Delta’s unimpaired inflow is fed by these forested watersheds in the Sierra. 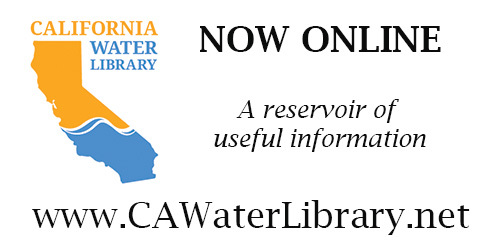 Together, the Sierra Nevada and the Delta are California’s natural water infrastructure, critical pieces of a complex system that provides clean, reliable water for the state. 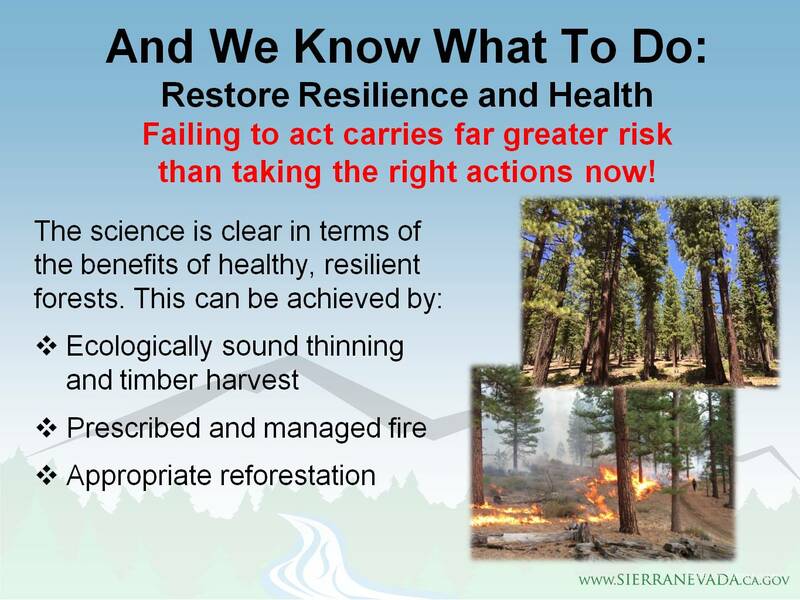 But today, many Sierra forests are overgrown and lack resilience. Over 80 million trees have died in recent years, a result of a combination of overcrowded forests, drought, and bark beetles. Catastrophic wildfires are becoming more common, causing air and water quality impacts that extend far beyond the mountain counties region. 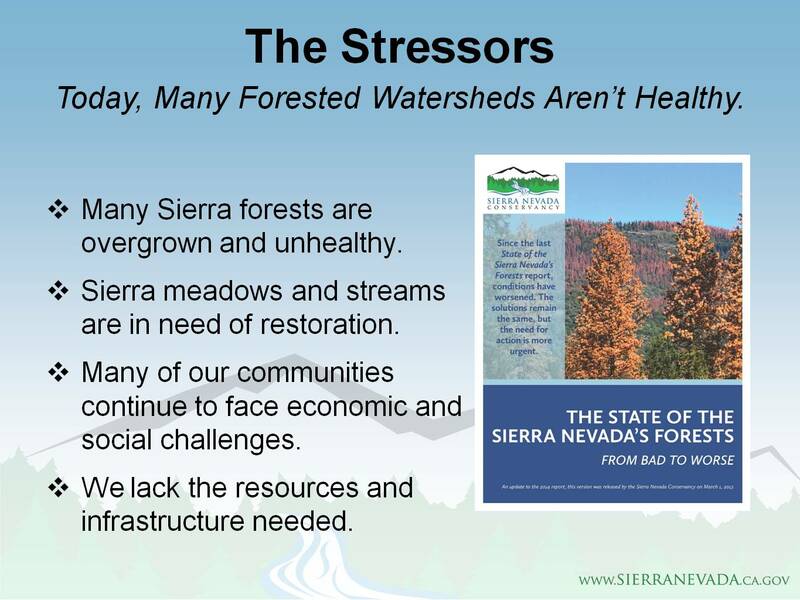 Thoughtful management and increased investment in our forests and forest health is needed if state is to continue to rely on the vast water supply and ecosystem services the upper watersheds provide. In October of last year, the Mountain Counties Water Resources Association hosted the forum, The Sacramento-San Joaquin Delta and its Sierra Nevada Tributaries: The Stressors and the Fix, which brought together scientists, agency officials, and resource managers to discuss the issues impacting the headwaters and the tributaries, and how these connect to the health of the Delta. The speakers included Jim Branham, Executive Officer of the Sierra Nevada Conservancy; Dr. Jay Lund, UC Davis Center for Watershed Sciences; Doug Demko, President of FishBio; Dr. Bruce Herbold, Retired EPA and fisheries consultant; Jose Setka, Manager of Fisheries & Wildlife Division for the East Bay Municipal Utilities District; and Michael George, Delta Watermaster. The forum concluded with a lively panel discussion moderated by Dr. Jeff Mount, senior fellow with the Public Policy Institute of California. The forum was sponsored by Placer County Water Agency, Mead & Hunt, Sage Engineers, and Stantec. This forum will be covered in three parts. This post will cover the presentations by Jim Branham and Dr. Jay Lund. Tomorrow’s post will cover the presentations by Doug Demko, Dr. Bruce Herbold, and Jose Setka. On Thursday, the series will wrap up with coverage of Michael George’s presentation and the panel discussion. The event was kicked off by Eileen Sobeck, the Executive Director of the State Water Resources Control Board, who gave some opening comments. At the time of the forum, Ms. Sobeck was quite new on the job, and so she briefly discussed some of the issues before the State Board, including cannabis regulations, the human right to water, and water conservation regulations. 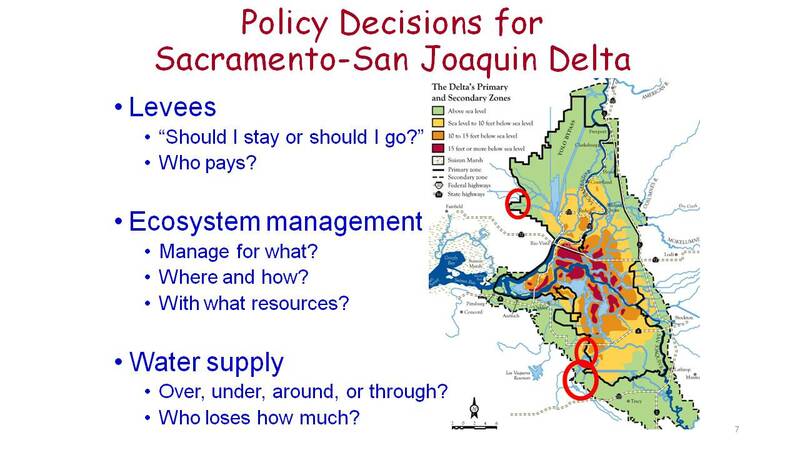 She also briefly discussed the update to the Bay Delta Water Quality Control Plan, noting that the Board’s strategy is to look at the entire Bay Delta ecosystem on a watershed level and consider flow and non-flow measures within an adaptive management structure, rather than focusing on individual species or individual water rights. Jim Branham has spent more than 30 years working on natural resource and rural community issues in California; he has been the Sierra Nevada Conservancy’s Executive Officer since 2005. He began by noting that the discussion of the Delta would be incomplete without talking about the watersheds that feed it. He presented a map showing the boundary of the Sierra Nevada Conservancy, noting that the Sierra Nevada is California’s primary watershed; it’s where the snow falls, the rain occurs, the reservoirs fill up, and then the water is transported all over California. It’s difficult to predict the weather from year to year, but the projections of increased temperatures on an ongoing basis do suggest that that over time, there is going to be more rain than snow in the Sierra, potentially diminishing the snowpack and resulting in longer fire seasons, he said. 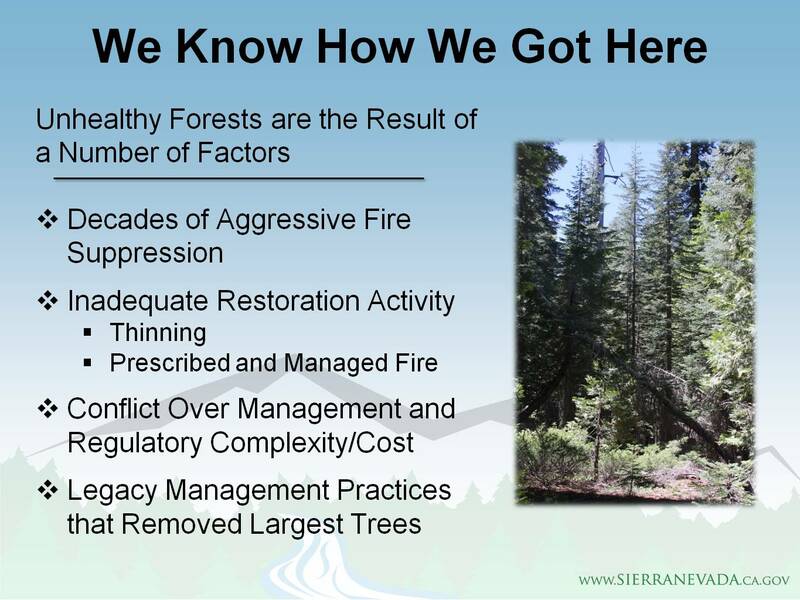 There are a lot of stressors in the Sierra Nevada; there are historic remnants from activities or lack of care that have resulted in unhealthy forests, meadows, and streams. “We lack the resources and the infrastructure we need,” he said. A lot of the communities in the Sierra Nevada are facing serious economic challenges as the state has moved away from many of the activities and the industries that drove the local economies over the last few decades, and we never figured out quite how to replace that, he said. When the forest is unhealthy, bad things happen, he said. 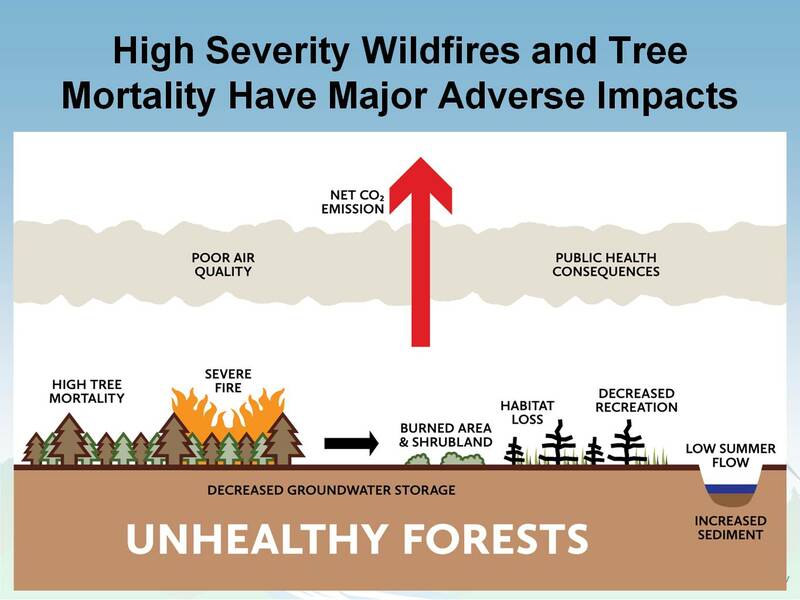 There are often large, high-severity fires and massive tree mortality. The recent tree mortality happened very quickly and the good winter seems to have slowed the spread of mortality more than many of the scientists thought it would. However, Mr. Branham noted that he’s been out to the Tahoe National Forest in the last few weeks, and there are still some pockets of mortality and even if there’s another good winter, they’re not sure what it’s going to do. The drought played a key role in that the drought led to the strain on the trees which allowed the beetles to attack the trees and to change them from green to red. 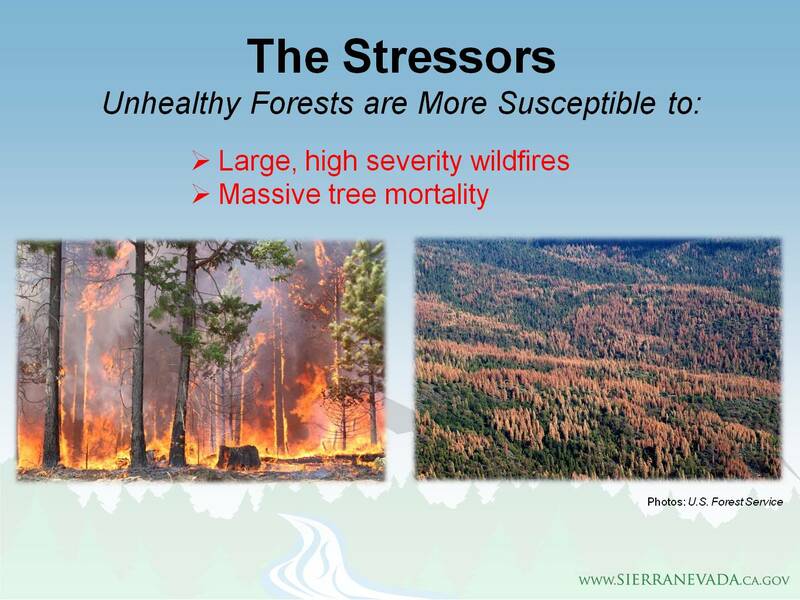 But he noted it was also the fact that it was overcrowded with too many trees competing for water, nutrients, and sunlight, so the stress happens much more quickly when there are unhealthy forests. There are a lot of fires, but the fires in recent years have been burning an incredible amount, Mr. Branham said. The Rough Fire was 247,000 acres and it simply dwarfed a lot of the other fires; a few years ago, 75,000 acres would have been a ‘monster’ fire, but by today’s standards, it’s much less surprising. 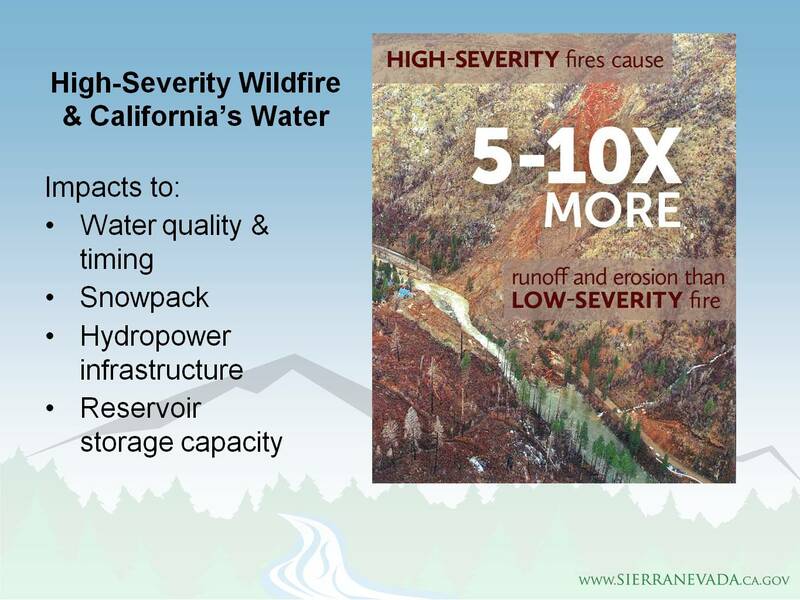 High severity fires cause 5 to 10 times more runoff and erosion than low severity fires, although Mr. Branham said it’s likely much more than erosion than that. There also isn’t any shade in the fire areas for the subsequent years after a fire, so the snow is completely visible to the sun and it melts much earlier in the year, and then the impacts to the hydropower and water infrastructure that lingers long after the fire is gone, he said. So how does this all connect to the Delta? The Mountain Counties brochure points out that the region provides 40% of the state’s developed water supply; the Sierra Nevada Conservancy region is a bit broader and says 60% of the state’s water, but if you add the remaining watersheds not included in the Conservancy’s region such as the upper Sacramento, the Pit and the McCloud, it’s probably closer to 90% of the freshwater going into the Delta, Mr. Branham said. “There hasn’t been a lot flowing out of the San Joaquin in recent years, and most of the Sacramento system is fed by the Sierra Nevada,” he said. We are well behind the curve, Mr. Branham pointed out. The USFS has estimated that they need to be treating about 500,000 acres a year in this state, however on a good year, they treat about 200,000 acres, so there’s a lot of catching up to do, he said. 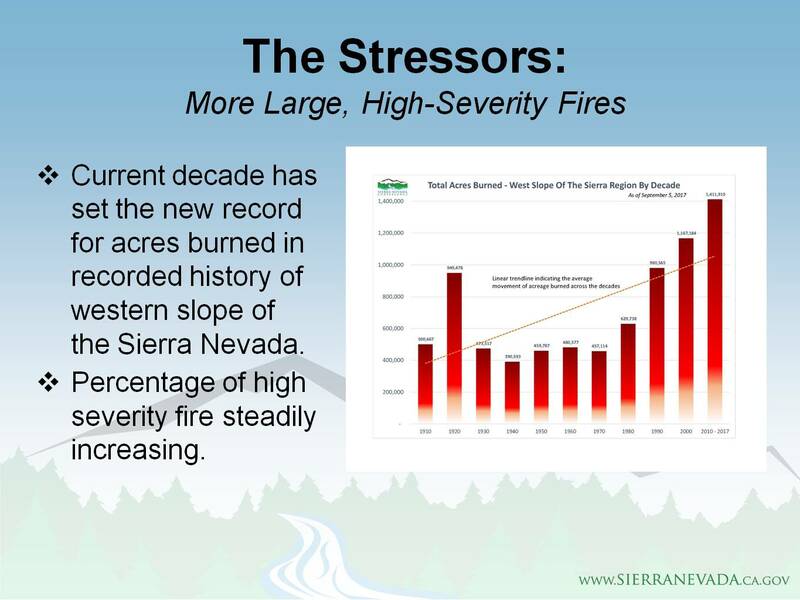 There has also been a lot of conflict; however, most have come to understand how damaging the high severity fires are, and scientists, local governments, and environmental groups trying to figure out what to do. There are still a lot of legacy practices; and where the larger trees have been removed, the vegetation that grew in its place is more conducive to carrying the fire through the stand, he said. 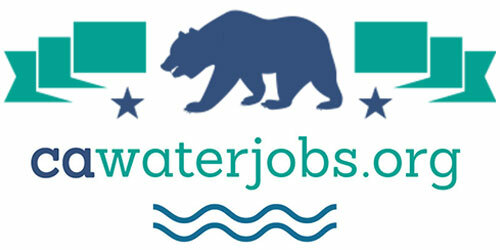 The Sierra Nevada Watershed Improvement Program was launched a few years ago with the US Forest Service, CalFire and other state agencies, local government, environmental groups, and industry. 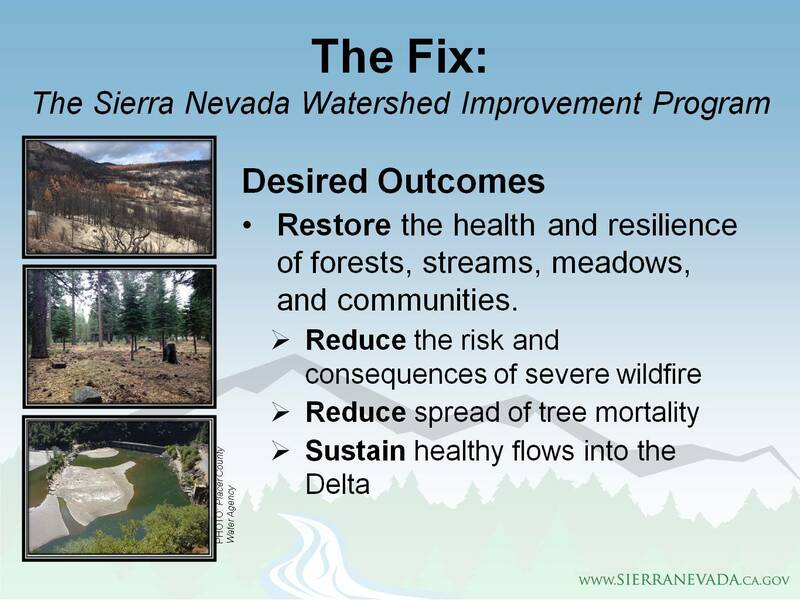 The program working towards a common set of objectives: the program seeks to restore the health and resilience of these forests, streams, and meadows, to reduce the risk and consequences of severe wildfire, to reduce spread of tree mortality, and to sustain healthy flows into the Delta. 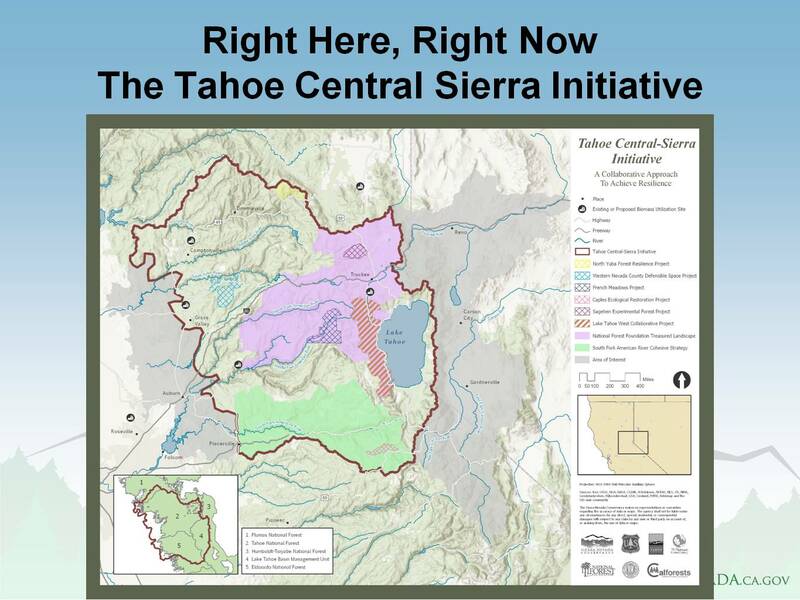 The Tahoe-Central Sierra Initiative is a multi-agency and entity partnership whose region encompasses the North Yuba River watershed to the South Fork American and includes the Truckee and the Tahoe Basin. 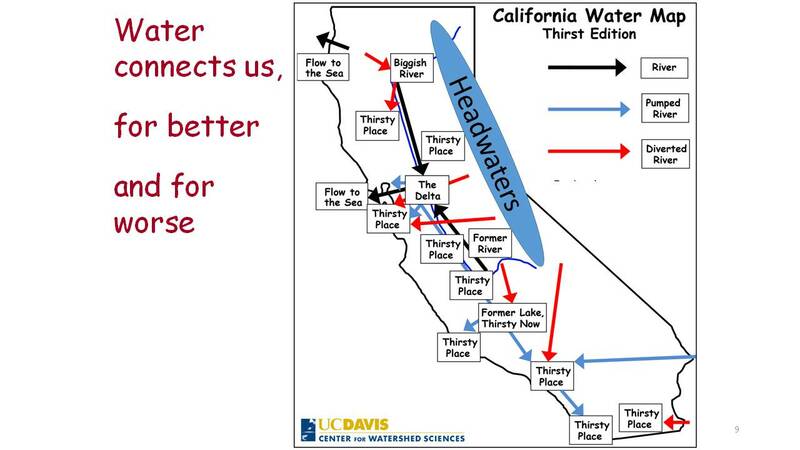 There is a big disparity in California in terms of where and when the water is and where and when we want it; we want it in the spring and the summertime where the people are and where the agriculture is, which is where the water isn’t, Dr. Lund said. 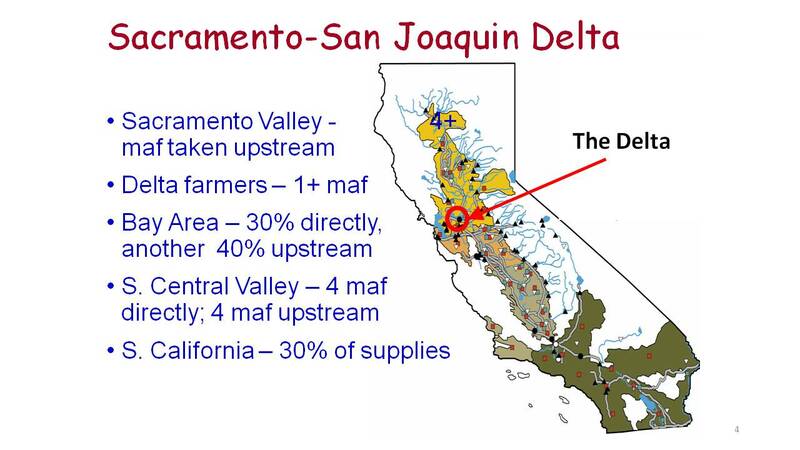 The Sacramento-San Joaquin Delta is the central hub for moving water from north to south, east to west, as well as in between seasons. 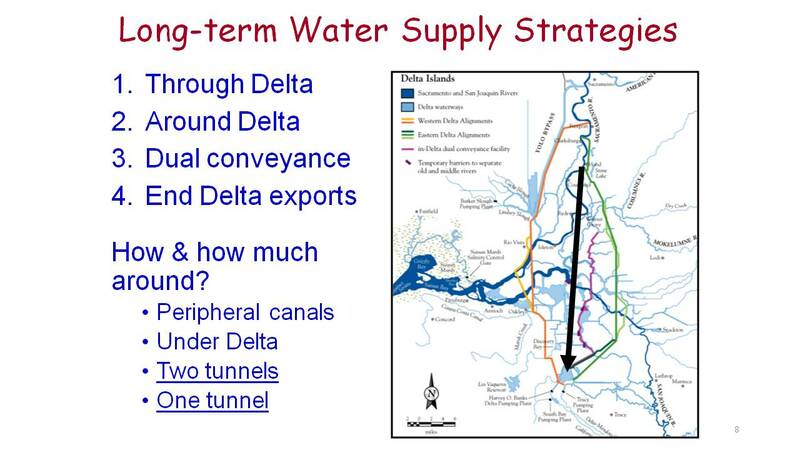 Dr. Lund reminded that it isn’t just about the water exported from the Delta; many millions of acre-feet of water taken from the Delta upstream. 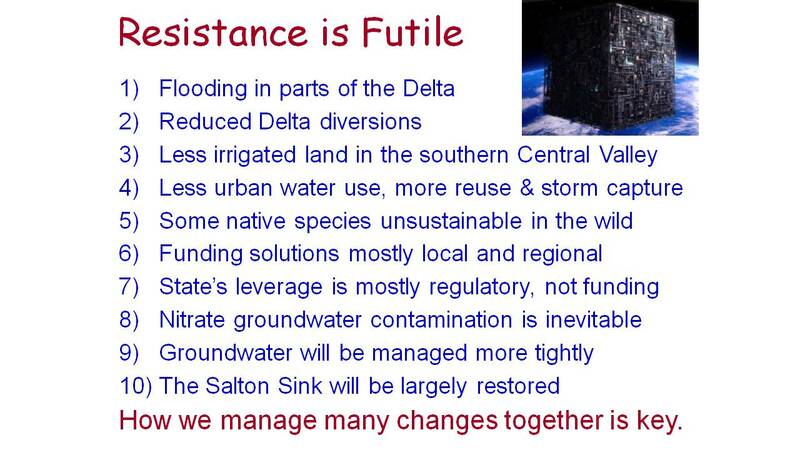 The Delta itself is a changing place; there are other things happening around the Delta that are important for the management of the Delta as well. 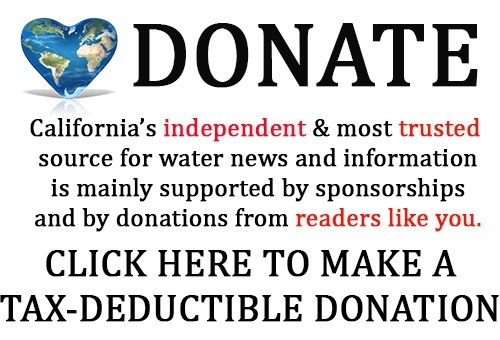 The Sustainable Groundwater Management Act just took away about 1.8 MAF of water supplies that they’ve been used to down in the San Joaquin Valley, and Dr. Lund pointed out that they have no other readily available source to replace most of that water; they are going to be looking to the Delta to keep as much of that as they can. “It’s a tough thing, and the Delta is going to tend to accumulate the problems of the rest of the system in a sense,” he said. 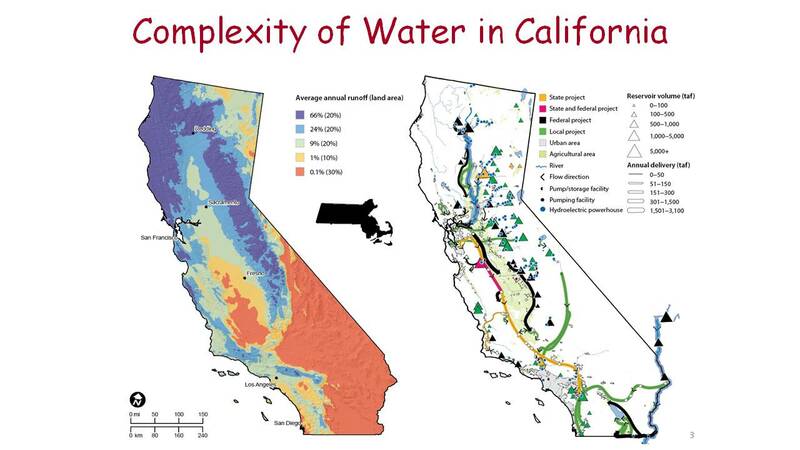 There are a lot of uses for water in California, but almost all of it comes from the headwaters up in the mountains; the tributaries are the links to the Delta and the Delta’s main water supply. Dr. Lund noted that there will be changes in that water supply as we lose snowpack and there will be greater extremes from climate change – more wet years, more dry years, fewer average years. In the future, there will likely be on average a little less water because the higher temperatures will mean more evaporation, he said. Water supply quality coming in to the Delta into the Sierras will probably similar; there will be some changes, but fairly similar, he said. There will probably be more extreme storms, especially with less snowpack to dampen the bigger storms, he said. 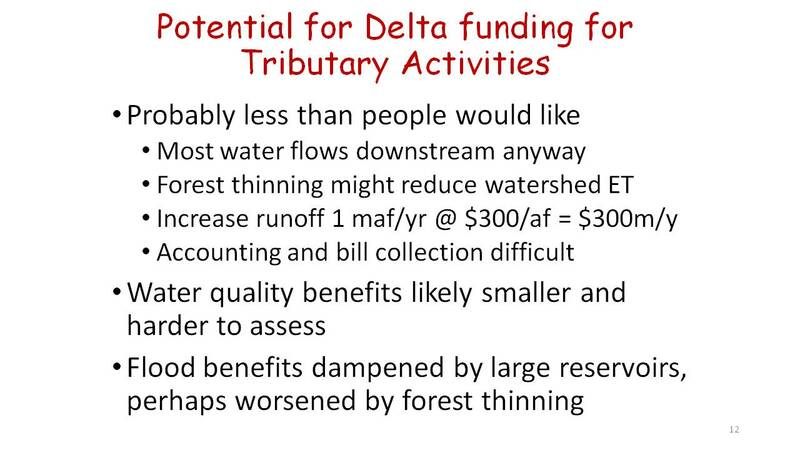 Dr. Lund pointed out there are changes coming to the tributaries regardless of water and regardless of what happens in the Delta. There are people moving into upstream communities. There will be climate change effects. Often at meetings, there are those that suggest that mountain meadows should be restored and the people downstream should pay for it because of the water supply or flood control benefits, Dr. Lund said. “I don’t think there’s a [strong connection] there, because there’s often a big reservoir that redoes the timing, so the benefits that actually see when you get down there for the water people are really pretty small,” he said. Water quality benefits are likely to be smaller and harder to assess, he said, and the flood benefits are going to be dampened by the large reservoirs. The forest thinning hydrologically is likely to worsen the process of rainfall turning into flood flows. “It might accelerate flood flows rather than slowing them down as a thicker forest might,” he said. These portfolios will occur at the local level, regional level, statewide level, and they all interact; however, we don’t really have a very good portfolio on the fish management side, he said. 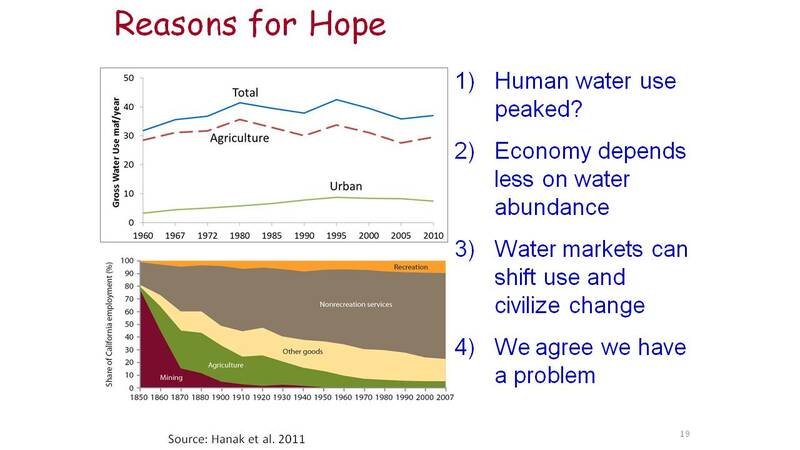 Nonetheless, Dr. Lund sees a lot of reasons for hope. Human water use has largely peaked in California, and the cities aren’t expanding much in terms of their water use. Rates of conservation are improving about as fast as the populations are increasing, maybe faster even. 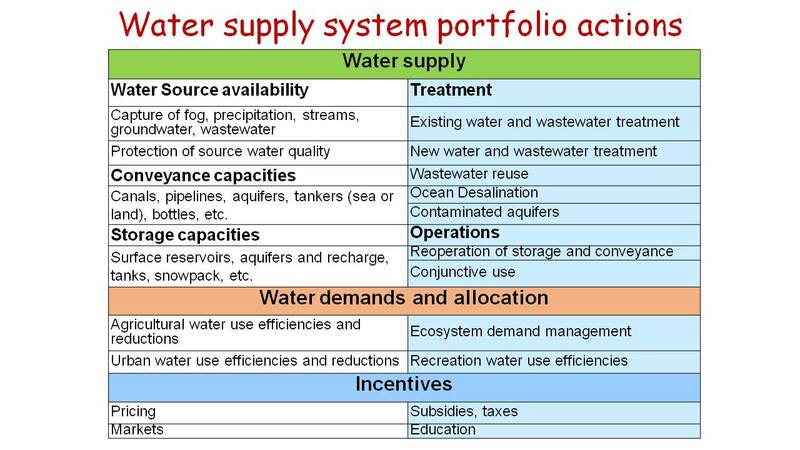 Water markets are helping civilize the discussions. We all agree we have a problem. The structure of our economy has made us much less dependent on abundant amounts of water; he noted that if the recent drought had occurred back in the 1930s when 30-40% of state’s employment was agricultural, we would have really suffered. “We suffer a big drought like we’ve had now with an economy that’s less than 4% or so agricultural, the rest of us can help them out economically because we can’t help them out in terms of water supply,” he said. Coverage from The Delta and the Tributaries forum continues tomorrow with part 2: Dr. Bruce Herbold, retired EPA and fisheries consultant; Doug Demko, President of FishBio, and Jose Setka, Manager of Fisheries & Wildlife Division for the East Bay Municipal Utilities District discuss salmon and native fish species, the effects of predation and hatcheries on salmon, and end with the success story of salmon on the Mokelumne River.